Daughter, Mrs Zythophile and I played a new game as we negotiated the M1 last week (or at least I did): spot other saloon cars laden to the roof with the finest Ikea supplies for fitting out a new undergraduate’s bedroom and kitchen. I won’t lie, I was slightly disappointed that Daughter did so well in her A levels she was able to spurn an offer from Liverpool University and flutter her eyelashes at York instead, which swiftly threw open the gates of the city. Sorry, Scousers: it’s not you, it’s us. I had many happy hours in the pubs of Merseyside when I was not that far out of studenthood myself. But the rest of the family were delighted that York was now the destination, and I could at least explore the pubs and bars of a city I’m ashamed to say, soft southern Jessie that I am, I hardly know. First impressions were good, apart from all the bouncers on the doors at 3pm. What time does it usually kick off in Tykeland? In London we like to leave it until well after we’ve had our cocoa before we need the A&E. It’s desperately infra dig to lump anybody before 11pm, unless there’s a footie match in the vicinity. Mind, I felt like lumping someone when I saw the pump clip pictured here, in an otherwise very pleasant and friendly craft beer bar in the middle of the city. It’s from Eye Brewing, based near Leeds, which claims to be “the UK’s first wheat brewery”, an assertion the white ale brewers of Devon and Cornwall in the 19th century and before would have forthrightly rejected, as would the monkish brewers at establishments such as St Paul’s Cathedral in London, where ale was being brewed on a considerable scale in the 13th century using wheat and oats, as well as barley. 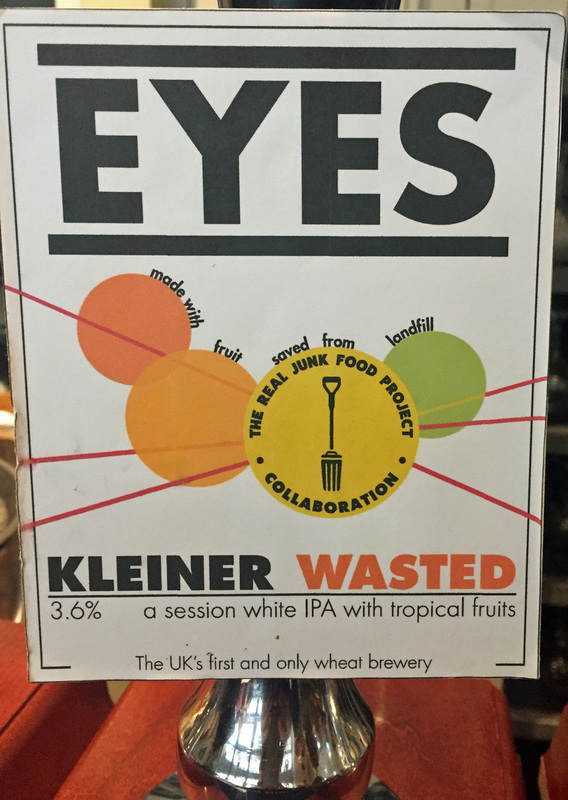 Worse, of course, was the claim that the beer, sold under the name Kleiner Wasted, was a “session white IPA with tropical fruits”, which squeezes four oxymorons into just six words, surely a record. OK, I know “session IPA” is now supposed to be a thing, but the beer’s specs, according to Eye’s website, include an abv of 3.6 per cent and 30 EBUs. That’s both weaker and less bitter than Eye’s own “wheat best bitter” (35 EBUs) and well below the US norm for a “session IPA” (around 4.5 to five per cent abv).